The Simpsons is a groundbreaking TV series. It's the longest running animated show, prime time show, and sitcom of all time. It seems hard to believe, but the show first aired over twenty years ago. Early on into it's amazing run, an arcade game based on the show was released. 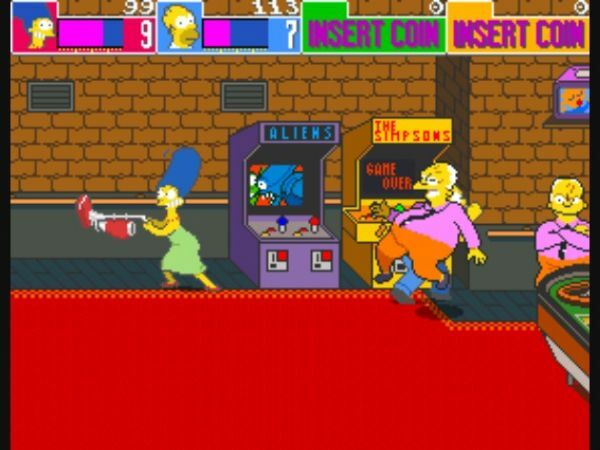 The Simpsons Arcade Game was one of the finest examples of the co-op beat 'em up you'll ever play. 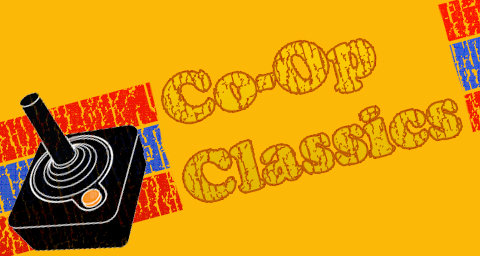 Authentic voice acting and spot-on animation would have been enough to make the game memorable, but add in one particular innovation, and the game becomes a true Co-Op Classic. The first thing you'll notice when playing The Simpsons is the distinctive animation style. Usually, when playing a game that's twenty years old, the graphics don't exactly hold up well. That's not the case with The Simpsons. It looks almost exactly like you are actually watching the show. The characters look incredibly similar to their on-show counterparts. Environments are well detailed, and if you look hard enough, all sorts of gags appear. In one level, a set of arcade games is seen, including The Simpsons, naturally, and Aliens (with a hilarious guest appearance by Marge). The odd bunny people from Simpsons creator Matt Groening's previous work make several appearances, notably in between levels and hiding in trees. I can't recall another arcade title that was so close to its source material. The Simpsons was a visual treat, on many different levels. As you'd expect, Homer, Marge, Lisa, and Bart are all present. The attacks of the family foursome are quite unique, and fun to use. Homer is armed only with his fists and belly, while Marge wields a vacuum cleaner against her foes. Bart bashes his opponents with his trusty skateboard. As a former saxophone player myself, I was always dismayed that Lisa used a whip-like jump rope as her weapon, and not her sax. The whimsical weapons serve to add to the game's humorous elements. The voice actors from the show were used for the speech samples, which are used often. There's a real sense of immersion when playing The Simpsons. The immersion is further served by the game's plot. As the Simpsons are shopping, they literally run into Smithers, who has stolen a diamond from Mr. Burns. After the collision, Maggie ends up with the diamond in her mouth like a pacifier. Smithers kidnaps the baby, and runs off, with the family hot on his heels. Hordes of goons, of course, stand in their way. The adventure takes the group from Krustyland to a cemetery, down a waterfall, into a delightful dream-like stage. The dream stage in particular is quite nicely done, featuring enemy donuts, killer saxophones, haunted radiation suits, and demonic Bart-clones. The final boss is a multi-stage monstrosity: an enormous, anthropomorphic bowling ball. The final stage is a TV studio, leading to the Springfield Nuclear Plant, where the final boss battles commence. I won't spoil the ending for you; suffice it to say that the last boss is an epic fight that will have you plunking quarters in like crazy. A nicely animated cut scene ties up the loose ends of the storyline as the credits roll. Page created in 0.7374 seconds.